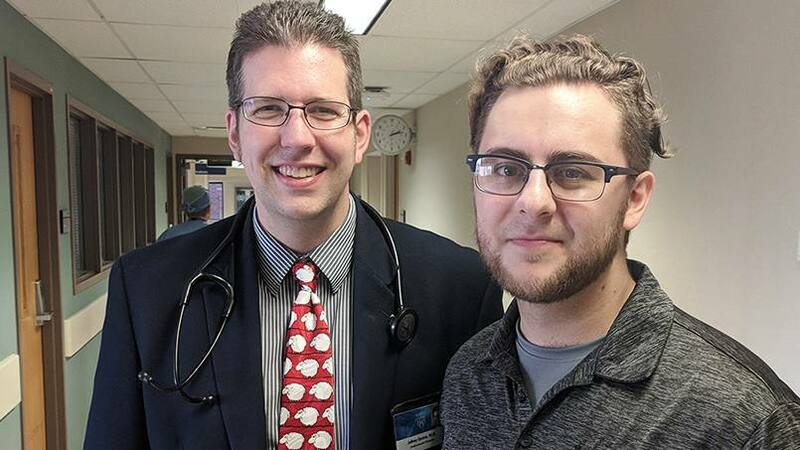 When Mayo Clinic Cardiologist Jeff Geske, M.D., saw news reports of a violent robbery that left a fellow video game enthusiast with a fractured skull, he knew he needed to do something to help. It was an incident that had the city of Rochester talking. This past February, two men walked into a GameStop store in downtown Rochester just before the store was set to close. After several minutes of looking around and talking with store manager Brian Scott, one of the men pulled out a hammer and hit Brian on the back of the head. As Brian lay unconscious and in a pool of blood, the two men filled a duffle bag with merchandise and fled the scene. When he regained consciousness, Brian willed himself to his feet and then "stumbled to a business next door to call police," who arrested the two suspects — "allegedly both video gamers" — just days later, according to the Rochester Post-Bulletin. When Jeff Geske, M.D., a cardiologist at Mayo Clinic's Rochester campus, saw a news report of the incident, he was shocked and appalled. Not only as a human being, but also as a member of the same gaming community. The attack had fractured Brian's skull and caused a brain hemorrhage. "They could have killed him," Dr. Geske tells the P-B. Brian spent two days at Mayo Clinic Hospital – Rochester, Saint Marys Campus, the paper reports, where he began his recovery from the injuries. "I was asleep for the worst parts of it," he jokingly tells the paper. He continues his recovery at home, telling the paper that while "we're so close … I'm definitely not better yet." Soon after the incident, Dr. Geske took it upon himself to lead Rochester's "tight-knit" gaming community into raising funds for Brian in hopes of bringing him "a little joy" during his recovery. "I wanted to show him that there's still good in the gaming community," Dr. Geske tells the paper. But the donations weren't the only good deed Dr. Geske had planned. He also organized a surprise event disguised as a "video game swap meet" at a local Rochester pizza place. He gave Brian the donations and was joined by approximately 100 other video gamers and local business owners who attended the event, the Post-Bulletin reports. They had a message for Brian and the community. "It gives the wrong impression of what video gamers are like," Dr. Geske tells the P-B of the night Brian was attacked. "They went into the store with the intention to hurt him," he says. "We wanted Brian to know that as a community, we were supporting him. The gaming community is a good community, and good things can come out of it." You can read the rest of Brian's story here. Then put your game face on and share your comments below before using the social media tools atop this page to share this story with all your gaming and non-gaming friends. Read about traumatic brain injury.